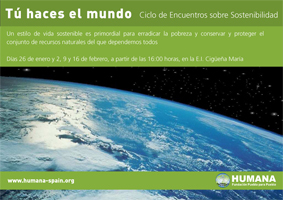 On January 18th a series of “You make the world” (“Tú haces el mundo”) seminars will begin at IES Carmen Conde in Las Rozas (Madrid). The seminars will consist of 24 sessions in which 15-year-old students will participate. The environment, recycling, and the Millennium Development Goals (MDGs) will be the main topics discussed at these meetings. The MDGs were adopted by 189 nations and signed by 147 heads of state and government at the Millennium Summit of the United Nations in September 2000. On January 26th, a similar cycle of seminars will begin at Escuela Infantil Cigüeña María in Las Rozas and will involve five sessions for the students’ parents and teachers. The purpose of these meetings is to educate the participants about the importance of sustainable living to eradicate poverty and preserve and protect the natural resources upon which we all depend.